With version 5 of vintrace we have introduced the concept of Block Assessments. Block Assessments can be found in the Assessments tab on the Block Overview. The purpose of a block assessment is to record information that may change against a block from season to season as well as information that may change within a season (such as estimated harvest dates and tonnages). Clicking the New Assessment button allows you to record an assessment. Capital Block – Is the block part of a capital project? 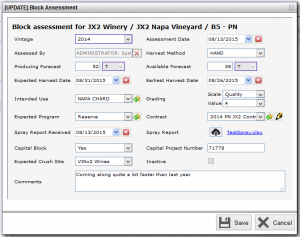 You can make any number of assessments for a block within a season. Each time you record an assessment, any fields you supply will be used to help build the seasonal information against the block. For instance, if one of the viticulture team is inspecting a block for quality and to make some harvest estimates, they can submit an assessment just including the Grading and the Producing / Available Forecast. When the assessment is submitted, vintrace will update the related fields on the Seasonal tab with this information and leave the others as is. This allows you to build up your seasonal information for a block as you go along, rather than being required to record the details all in one go. Information from the Seasonal tab will be used as default selection options when creating Bookings in vintrace. 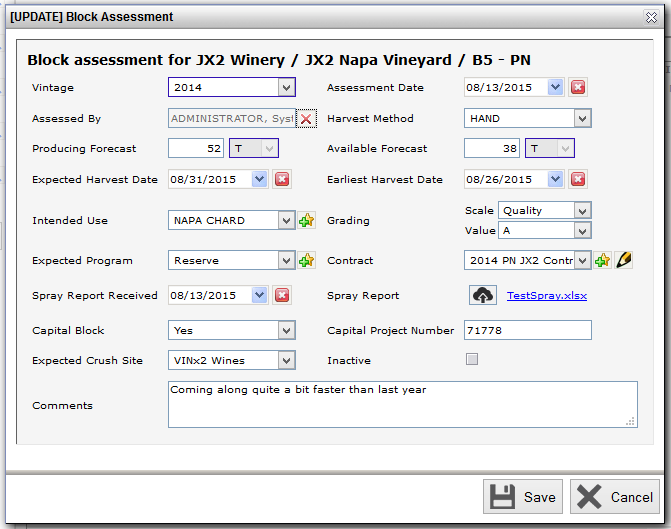 The Assessments tab contains a record of all the assessments that have been made the selected vintage. Clicking the View option will allow you to see what was recorded at the time. Users with sufficient permissions will also be allowed to correct an already submitted assessment in here as well.